Certain things happen at the same time every year. Like daffodils blooming, or finding mouse droppings in your kitchen. Or minding your own business when another motorist plows into your car. I was on my way home from work yesterday when I noticed the cars in the left lane on I-5 slowing. Slowing a lot. Like to a stop. One car veered onto the left shoulder. Something was in the road. Something white and square. Can that be right? The Lexis SUV pulled over in front of me on the right shoulder. I pulled out my insurance card and a business card. I wrote my insurance policy number on the back of my business card and grabbed a notepad. I waited for a pause in the whooshing of passing cars that shook my little Honda. When I felt safe, I slipped out of my car and walked around the back to determine that yes, in fact my rear had been smushed. I walked along the passenger side of my car to the passenger door of the SUV. A white-haired lady was leaning forward clutching her knees. She gestured for me to come around to her side of the car. “I don’t think it’s safe,” I said. She offered to let me get in the car, but I couldn’t open the passenger door all the way because of the guard rail. “Are you OK?” I asked her. I asked HER! “Do you want me to call someone? Do you need medical attention?” Do YOU need medical attention?! 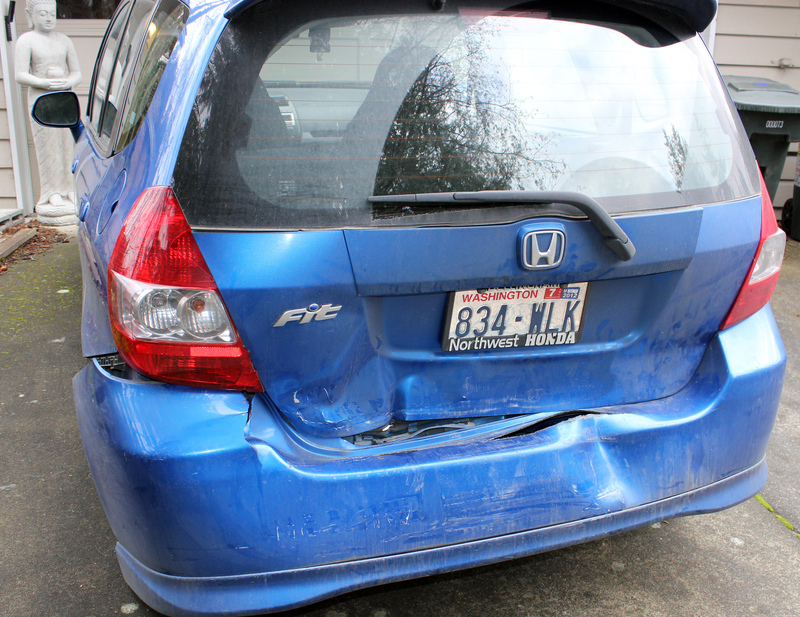 “I can’t tell how much damage there was to my car.” YOUR car? I walked around to the front of the SUV and came back. I had to squeeze through the passenger door to reach her purse, which had fallen on the floor. It took her a few minutes to find her insurance card. I took down her info and let her drive away. I watched semi trucks whiz by and visualized getting run over while trying to get back in my car. I opened the passenger door, contemplating crawling in that way. Nah, easier to wait for a break in traffic. Man those cars are going by fast. Truck. Truck. Sedan. Oh, there was a little break, I could have made it in that time. I’ll wait for the next one. Truck. Truck. Whoosh. Truck. OK. Another break. Go. Go. Phew. Made it. Back in the car. I called Rob. I called Allstate. While talking to Allstate and feeling the shudder of every passing car, Johnny Law showed up. Oops. Was I supposed to call him? He was a little irritated that I hadn’t, but I hadn’t wanted to wait around for the State Patrol to take a report. I didn’t care if the lady got cited. I got what I needed. For sure I was rattled. My head started to hurt as soon as the SUV made impact. I feel lucky that I wasn’t seriously hurt. And that the other driver didn’t seem to be injured. I’m really happy that Mia wasn’t in the car. She likes to sit right up against the tailgate, and even if she hadn’t been, she would have been knocked around worse than me. I dropped my car off today, got a fun little rental. Reminds me of a hearse. Have to figure out how to transport my doggies around town, since pets aren’t allowed in rentals. Nothing to do now but wait to hear from the body shop. Maybe watch that new NBC show about Broadway. Not to mention that you came straight to class after all that! Very glad that you’re okay, and that Mia was having a home-day.